Many of my paintings are inspired by stories from literature, mythology and history, but many others are their own stories,” says James C. Christensen, “stories that have yet to be told. The elements of this scene are familiar—the crumbling tower, the thorns and brambles surrounding it and the princess trapped within—but it’s up to the viewer to create the plot. I like to encourage imagination wherever I can and I find it very satisfying to create these points of departure. Two of the nicest things a fan can tell me are ‘I made up a story about this painting’ or ‘. 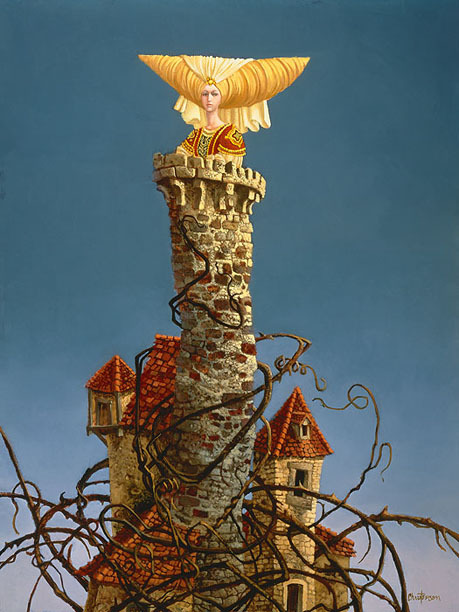 . . this makes me smile.’” Here at The Greenwich Workshop, we’re wondering if she climbed the tower with the hat on, or did it get handed to her in a fly-by after she arrived? Hang this new Christensen Fine Art Edition in your house and begin a never-ending story with your friends and family.